There is a wrong perception for some people that once you are a mother, you'd have messy hair, tired eyes and all. But that isn't the case because no matter how supermoms are occupied with household chores and with the kids, we would always aim to look great. Yes, we might look tired and we may have messy hairs when we leave home but that doesn't mean we will pass on taking care of our looks and our skin because we love ourselves. That is why we would look for products that are easy to apply and would give lasting results for a beautiful and healthy skin. Admit it. No matter how messy one's hair looks like or no matter how tired one's eyes appear, if the skin is glowing, she will still look lovely. 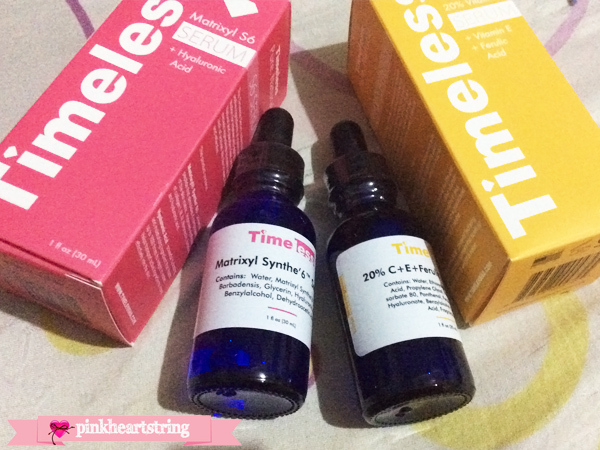 With that, I tried the Timeless Organic Skincare Serum Matrixyl Synthe'6 Serum and the 20% Vitamin C+E Ferulic Acid Serum. If you are looking for skincare products that are not harmful to your skin, organic skincare serum is the answer since it contains ingredients that are beneficial to your skin. This serum boosts six skin-rebuilding essentials which also features anti-wrinkle complex that helps reverse the signs of aging by stimulating six major constituents of the skin matrix and dermal-epidermal junction. By using this, it evens out skin and it also smooths wrinkles from the inside by rebuilding the skin. That is why when used; it feels like the skin is stretched. And slowly, the wrinkles, as well as black spots, will go away. And the good thing is you won't feel that you actually put something on your skin because it isn't sticky or oily at all. It also easily absorbs in the skin which means that it is indeed working on the inside. Matrixyl Synthe'6 - derived from the tripeptide KMK naturally found in collagen VI and laminins. We use a 2% concentration for maximum results. This serum contains Vitamin C which is an antioxidant that evens skin tone and it also helps build collagen. This product also contains vitamin E and Ferulic Acid which is used to extend the life and effectiveness of vitamin C. A 20% concentration of L-ascorbic acid is also added in the serum for maximum benefit. Our product is guaranteed fresh and effective for 3 months. Like the other one, this is also easy to apply with just 2-3 drops. It is non-greasy and it dries fast. It doesn't have any smell or color and has more active ingredients. 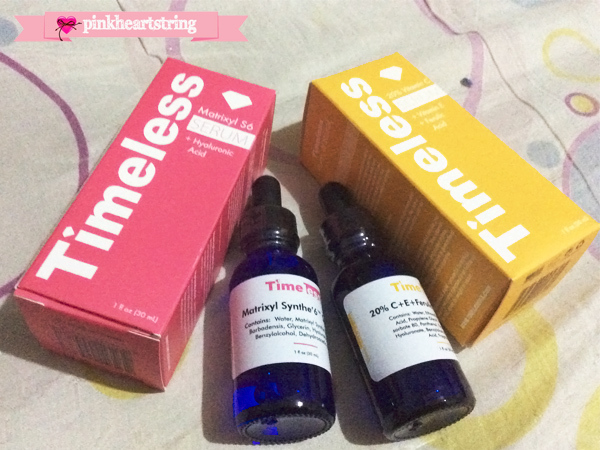 These two serums are more effective when used together. It gives a healthier skin that gives a natural glow. To get best results, it should be used regularly for about three months. But you can already see some changes in as early as two weeks. During daytime, use the Timeless Organic Skincare Serum Matrixyl Synthe'6 Serum and the Timeless Organic Skincare Serum 20% Vitamin C + E Ferulic Acid Serum 1 oz during the night. With that, you will leave the house and wake up with a healthy skin. 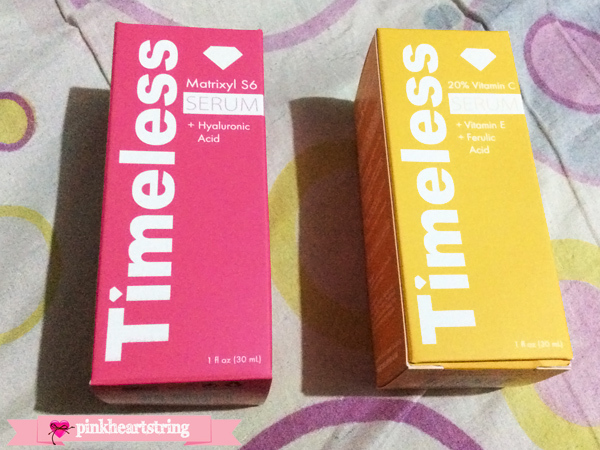 Expect lovely results after using this serum from Timeless Skin Care. And of course, don't forget that regular use can give you the kind of skin you want!